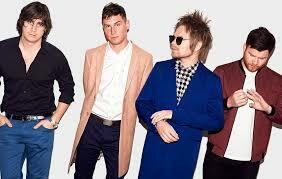 True to their genre-defying style, Enter Shikari’s support acts tonight are suitably eclectic. Particularly the first band up – Cardiff’s Astroid Boys. Whilst they may be a new name to most, there are plenty of dedicated fans scattered around the arena tonight. Kicking off with the deep beats of ‘Mask’, the highlights of the set come with the riffing ‘Minging’ and chant-a-long ‘Foreigners’. Lower Than Atlantis follow, delivering a more straight-up rock sound and sampling tracks from their latest record ‘Safe in Sound’. ‘Boomerang’ and its catchy intro stands out, as does the defiant ‘Get Over It’. The quadraphonic sound, a proud addition to Enter Shikari’s set since they made the step up to arenas, is in full force for their 10 minute pre-show countdown. ‘The Sights’ opens the set, giving one of many nods to their latest release ‘The Spark’. The arena-ready anthems that made up the record are at home tonight with the passionate audience chanting along the lyrics faultlessly to old and new songs alike. ‘Undercover Agents’ sounds truly massive, and the stripped back ‘Airfield’ gives way to a rousing finale, accompanied by a fitting video of a plane taking flight. Last record ‘The Mindsweep’s lead single ‘The Last Garrison’ proves that it is still one of the most engaging examples of the band’s infectious fury, and the gutsy ‘Radiate’ (restarted after a what-are-the-chances-of-that accidental switch-off of the prominent electronics by drummer Rob) whip the audience into a frenzy. Closing the main set with a frantic medley of hits (‘…Meltdown’ making a welcome return to their live set), their encore of ‘Redshift’ and ‘Live Outside’ is a euphoric celebration of a fantastic evening and meticulously-curated show. As Rou thanks the audience for the pleasure of performing in the venue that marked their first ever arena headline show on 2016’s ‘The Mindsweep’ tour, the pleasure definitely belongs to the sweaty, grinning crowd of Nottingham this evening who couldn’t have asked for anything more. Brilliant review! An Enter Shikari gig is my happy place, they’re phenomenal live!